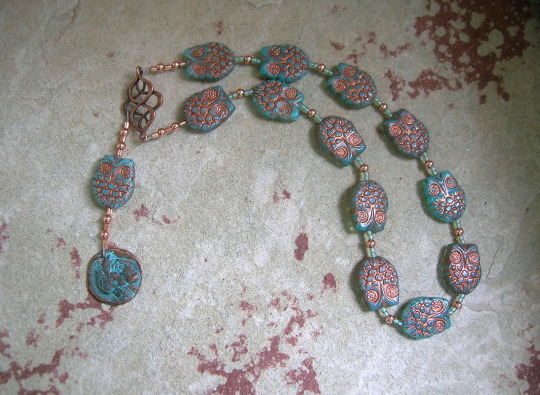 The owl is sacred to Athena, great goddess of ancient Greece, and when I found these beads–made of Czech pressed glass in aqua blue with a copper finish–I knew exactly who they were meant for. The Athena pocket prayer beads are approximately 16.25″ (41.3cm). They come with a prayer to Demeter, written specifically to be used with this prayer bead design and with a cotton muslin bag for storage. You can, of course, use the beads with any prayers, or for any god or gods, that you choose or that resonate with you. They are available here at my Etsy shop. 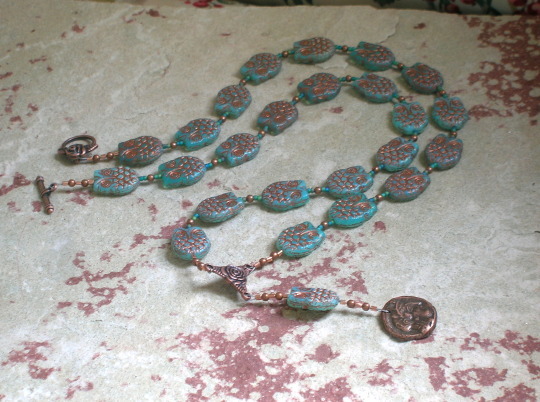 The Athena prayer bead necklace is approximately 28″ (71.1cm) long and closes with a toggle clasp. It comes with a prayer to Demeter, written specifically to be used with this prayer bead design and with a cotton muslin bag for storage. You can, of course, use the beads with any prayers, or for any god or gods, that you choose or that resonate with you. They are available here at my Etsy shop.